What initially drew me to this series was its peculiar episode format: in the first (and current) series there are nine episodes, but unlike most other anime each episode is only 12 minutes long. It's actually a very watch-able time, it's not too long for when you don't have much time and it keeps each episode interesting. I think many other serialised shows could benefit from being shrunk, I'm sure you could have an episode of most Western television shows cut in half and still retain the necessary elements to keep the plot the same. As with the timing of the episodes, the premise of the story also drew my interest; instead of being yet another series centred around a team of high school girls or evil robotic cyborgs (not that those in certain does are a bad thing mind… ahem) it shows the adventures of a young businessman who seems to be a dead end marketing job and a 20 year old aspiring seiyū (which is ironic in itself considering seiyū artists would be involved in the production of the anime itself) who idolises Audrey Hepburn. An interested premise! I'm watching the DVD release with English subtitles. 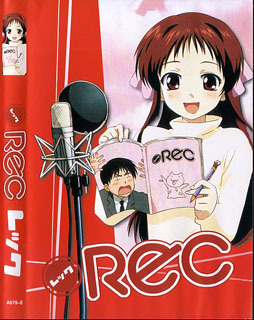 I don't think there's an English dub available, and I don't care, I hate dubs! ;). Seeing as I'm so early into the story I'm not going to rate it just yet, but I can tell already that it could be in my top 5. With this series I'm going to be doing something I haven't done before; I'm going to review each series as I watch it. Even if nobody else is interested at least it gives me a record of what's going on! I've seen Episode 1 already but it's almost 02:00am here and I should get to bed; I'm going with my mum to the hospital for her chemo very early tomorrow. Actually… today, damn it! Newer post ← Rubenerd Fugly Car Awards!